KABUL – Across Afghanistan, behind the obvious battles fought for this country's soul, a shadow war is being quietly waged. It's being fought with spies and proxies, with hundreds of millions of dollars in aid money and ominous diplomatic threats. Then there is fear. Pakistan and India have already fought three wars over the past seven decades, and Pakistani military leaders are terrified of someday being trapped militarily between India on one border and a pro-India Afghanistan on the other. "We can't afford an unfriendly government in Afghanistan," said Mohammad Sadiq, Pakistan's ambassador to Afghanistan. The shadow war began in earnest in the wake of the 2001 U.S. invasion, when the Taliban government was forced from power and New Delhi began courting Afghanistan's new leaders. It was a move into a country that Islamabad, a fierce supporter of the Taliban government, had seen as its diplomatic territory for two decades. But New Delhi quickly became a close ally of President Hamid Karzai, who will travel to India early next week for talks aimed at strengthening ties between the two countries. On the surface, both India and Pakistan are bringing help to a country that desperately needs it. New Delhi has built highways in the western deserts and brought electricity to Kabul. It is constructing a new Parliament building and offers free medical care in clinics across Afghanistan. Despite its immense spending needs — India has widespread poverty and staggering infrastructure problems despite its rapidly growing economy — it has given more than $1.3 billion in development aid. That, in turn, has sparked Pakistani efforts, with Islamabad spending about $350 million on everything from school textbooks to buses. But this is far from pure humanitarianism. Gen. Stanley McChrystal, the top U.S. and NATO commander in Afghanistan, laid out the situation bluntly: "While Indian activities largely benefit the Afghan people, increasing Indian influence in Afghanistan is likely to exacerbate regional tensions and encourage Pakistani countermeasures," he warned in a report late last year. Heightened tensions are the last thing the U.S. wants. The Afghan war has killed more than 1,800 coalition soldiers — more than 1,100 of them Americans. More than 2,400 Afghan civilians were killed just last year. If the competition over Afghanistan is rooted in a cocktail of issues, much of it revolves around the Taliban. New Delhi's perceptions of modern Afghanistan have been molded by its memories of the 1996-2001 Taliban government, the fundamentalist Muslim regime which rose to power with Pakistan's help. It was a time when New Delhi was openly despised in Kabul, when anti-India insurgents trained in Afghan camps and the hijackers of an Indian airliner were welcomed here as heroes. Even after the Taliban government fell, Pakistan's powerful spy agency, Inter-Services Intelligence, or ISI, retained links to the Taliban insurgency now battling the American-led forces and the Karzai government, in case the Taliban ever return to power. But if there's one thing New Delhi does not want, it's another militant Islamic government in Kabul. 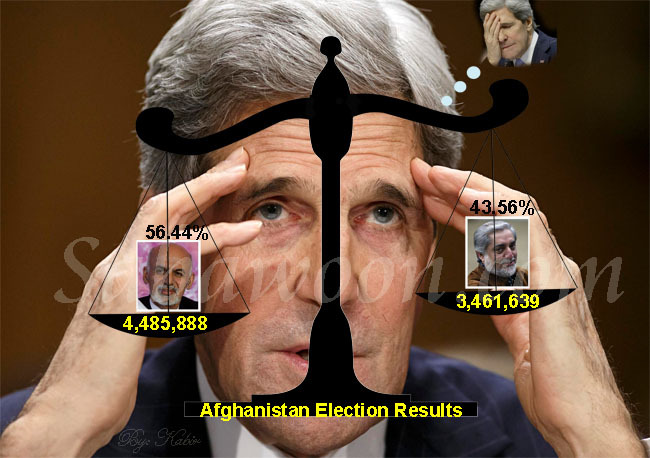 "We want the stabilization of Afghanistan because it is directly related to our security. Plain and simple," said Jayant Prasad, the Indian ambassador to Afghanistan, speaking inside his heavily guarded Kabul residence. India has paid heavily for its Afghan involvement. The Indian Embassy was bombed in 2008 and again last year, leaving 75 people dead. Six Indians were killed by militants during the construction of an India-funded highway. Two Kabul guest houses popular among Indians have been attacked. The last attack, in February, left at least six Indians dead and forced New Delhi to temporarily close its medical and teaching missions in Kabul. India blamed that attack on the Pakistan-based militant group Lashkar-e-Taiba, the same group believed to be behind the 2008 Mumbai terrorist attacks. India and the United States have both said the embassy attacks were carried out by militants allied to Pakistan's ISI. The Pakistanis "are bringing the proxy war to Afghanistan and we are the targets," said Prasad. It's an accusation that Pakistan angrily denies. "India has always used Afghanistan against us," said Sadiq, the Pakistani ambassador. Karzai has made little secret of his preference for India. The president, who was educated in India, has loudly welcomed New Delhi's assistance while rarely mentioning Pakistan's aid. Other Afghan officials barely disguise their distrust of Pakistan. Pakistan wants "a puppet state in Kabul, a subservient state," said Muradian, the foreign ministry adviser. "India wants a stable, pluralistic Afghanistan." Certainly, India has shown it is willing to play diplomatic hardball. Even India's allies say New Delhi has a large presence in Afghanistan from its foreign intelligence agency, the Research and Analysis Wing, or RAW. At least one victim of the February guest house attack was an undercover RAW agent, a senior Afghan official said on condition of anonymity because of the sensitivity of the issue. According to Islamabad, many of those agents are providing support to separatist militants in Pakistan's Baluchistan province — an accusation New Delhi denies. The reality remains murky. Pakistan keeps Baluchistan largely sealed off to outsiders. Western diplomats, speaking on condition of anonymity, say Indian intelligence is believed to be in contact with the Baluchi separatists, though it's unclear if they provide any support. India also is keeping in reserve its longtime links to Afghan warlords, in case Afghanistan is again divided by violence. For years, New Delhi supplied the leaders of the Northern Alliance, the collection of ethnic militias that battled the Taliban (and often one another), with food, intelligence and medical care. Later, after the Alliance helped the U.S. oust the Taliban in 2001, the warlords scattered into government and business — and sometimes into crime or exile. But India remains in close contact with a range of the former militia leaders, according to people with close ties to New Delhi's foreign policy elite, speaking on condition of anonymity because they were not authorized to speak to the press. New Delhi's biggest worry is that U.S. forces will withdraw from Afghanistan before Karzai's government is in full control of the country. An early withdrawal, India fears, could allow Islamabad and the Taliban militants to gain more power in Afghanistan and potentially even usher in another government hostile to New Delhi. While a full American pullout appears unlikely anytime soon, U.S. military officials have angered New Delhi by talking about the possibility of allowing some Taliban to join the Afghan government. India warns it could form a coalition with Iran — an alliance that would infuriate Washington — if the Taliban appear poised to return to power. The "self-interested coalition" could include Russia and several Central Asian states that would also fear a Taliban return, according to an Indian with knowledge of the diplomatic maneuvering. For now, though, India's program to win Afghan hearts and minds is clearly working. Take the three Indian doctors working in the dusty northern town of Mazar-i-Sharif, dispensing prescriptions and performing surgeries in a faded colonial-era hospital that somehow survived the years of fighting. Every morning, clusters of women in blue burqas gather in the narrow hallway outside the clinic, while men wait in the parking lot. They are the poorest people in one of the world's poorest countries: widows, the unemployed, the elderly. They measure the distance to the clinic by the cost of getting there — and a 10-cent bus ride is a painful investment. About 150 arrive every day for free care and medicine. An old man named Myagul — he has only one name, and didn't know his age — had been coughing badly, he said, and growing dizzy when he stood up. The doctors prescribed blood pressure medicine and cough syrup. He'd already been to a handful of doctors, but they had all asked for fees he couldn't afford. But on a warm Afghan morning, the old man with the greasy beard and the torn blazer left the clinic clutching a handful of medicines, weary but pleased. "Finally it was these Indians who helped."